These Tropical Papaya Boats have a fruit “bowl” (that you can eat)! Filled with creamy Greek yogurt and topped with fresh fruit + crunchy granola. If you want to keep this recipe vegan friendly, you can use your favorite non-dairy yogurt instead. MAKE THE PAPAYA BOATS: Slice the papaya in half lengthwise (making sure you’ve chosen a really ripe one or it will taste bitter instead of sweet!). Used a spoon, scrape out the seeds and discard. STUFF WITH YOGURT + FRESH TOPPINGS: Divide the yogurt evenly between the two boats, spooning it into the center. Then top with fresh fruit. 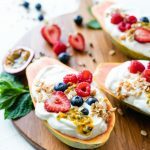 Papaya tastes even better when you add an acid component to it, so if you won’t be using the passionfruit consider adding a squeeze of lemon or lime juice on top to brighten things up. To re-create the ones seen here exactly add the following: 2 passion fruit, and a handful of mixed berries (raspberries, blueberries, sliced strawberries) and a sprinkle of granola. *Or other sweetener of choice: like maple syrup, honey, agave nectar, or stevia drops. IF YOU WANT TO MAKE THIS VEGAN-FRIENDLY: Use a non-dairy yogurt, like coconut yogurt, in place of Greek yogurt.